Co-Is: Oyvind Breivik (MetNo), Luigi Cavaleri (CNR), Victor Alari (TUT). Figure A. Wave-current interaction implemented in the NEMO ocean model. The coupling of models is a commonly used approach when addressing the complex interactions between different components of earth system evolving on well separated time scales. In climate research and forecasting activities, advanced models are needed, which consider regional and local air-sea interaction. Consideration of wind waves and coupling between atmosphere and circulation models appear more and more as a key element for high quality operational marine-environment information and products for stakeholders and operators from marine safety, marine resources, marine environment and forecasting. Coupling between ocean circulation and wave models has a potential to enhance the quality of these products significantly and provides also a new perspective for theoretical basic research on synoptic and climate time scales. Wave2NEMO deals with improving the coupling between ocean circulation model systems and wave models for the regional scales. This CMEMS service evolution project is working on further implementations and developments within the wave model WAM and the NEMO ocean model together with the forcing which explicitly includes: the effect of waves from wave models on the upper ocean dynamics; improved validation methods by retrieved wave information from satellite data and in situ platforms; demonstrating the interaction of waves and currents at small scales both in the middle of oceans and near the shoreline. The target areas are the North Sea, the Baltic Sea and the Mediterranean. 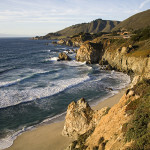 The impact of wave-induced forcing on the dynamics of the regional seas is studied. Additionally, Wave2NEMO demonstrates the quality and the performance of ocean wave forecasting. Figure B. Time series of surge: observations (black circles), NEMO-only (red) and coupled model (green) at Helgoland station during storm Xaver in December, 201 (Staneva et al., 2017). 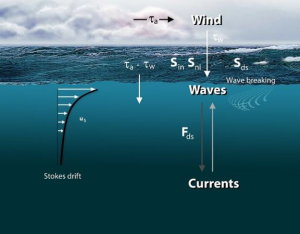 Wave-current interaction through the Stokes-Coriolis force and sea-state dependent energy and momentum fluxes have a substantial potential to shape also the mean circulation and basin wide stratification and even surface temperature pattern in North and Baltic Sea. This has wide implications for particle transport, biogeochemical processes and air-sea heat fluxes. Hence, wave-current interaction cannot be neglected in search and rescue; oil-spill and larva drift modeling. Moreover, wave-current interaction needs to be considered also for studying climate processes and ecosystem dynamics on regional scales. Wave2NEMO R&D project contributed to the advancement of theoretical understanding of regional systems and demonstrated that coupling circulation and wave models could significantly improve model results. Increased demand to improve wave and storm predictions requires improved representation of physical processes. Comparisons with observations showed that the use of coupled system reduces the errors, especially under severe storm conditions. This justifies the further developments and implementation of the coupled model systems, for both, operational and climate, research and development activities. Wave2NEMO consortium consists of four Partners: Helmholtz-Zentrum Geesthacht, HZG,Germany (project leader), Norwegian Meteorological Institute MET, METNorway, Norway, Institute of Marine Sciences, Italian National Research Council, ISMAR, Italy, Marine Systems Institute, Tallinn University of Technology, MSI, Estonia. Most of the CMEMS target fields – marine safety, marine resources, marine environment and forecasting – can directly benefit from this R&D work. 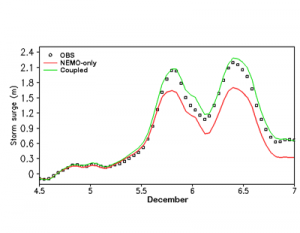 Wave2NEMO is continuously making connections to CMEMS in order to support the future production of more consistent ocean-marine weather information including also surface waves, as often requested by users.